RESULTS – The 18 hole stableford played on Sunday the 7th of April had a clear winner with Terry Cannings 38 points. Second place went Ross Andrew with 35, Lorcan Egan won the prize for best gross score and Michael Simon came 3rd. This was the first of the year’s Golfer of the Year competitions so well done to all the above for getting their campaign off to a good start. The first of this years Thursday evening competitions went to Tommy King who had 21 points for his 9 holes. Lorcan Egan and Brendan Gaffney came 2nd and 3rd respectively. We are still seeking members to sponsor Thursday competitions, please put your name on the list on the noticeboard in the clubhouse. FIXTURES – Mens’ competitions for the coming week include the Thursday 9 hole stableford and another 18 hole stableford next Sunday , the 18th of April. LADIES “GET INTO GOLF” – The ladies section hosted a very successful information evening this week for their upcoming “Get into Golf ” programme . The programme consists of 8 weeks of group classes with a professional golfer at the very keen rate of 50 euro, commencing this Wednesday, the 10th of April. For further information contact Aisling at 0872029064 or via the clubs Facebook page “boylegolfclub”. SEAN YOUNG R.I.P – Although the first sport that came to mind when Sean Young’s name was mentioned was unquestionably Gaelic Football, he was also a golfer of considerable ability, having played off a single figure handicap for many decades in Boyle, winning both Captains and Presidents Prizes along the way. He was a popular and valued member of our club and we wish to express our sincere condolences to the Young family on their bereavement. FIXTURES – The big event for the month of April is of course the “Voucher” competition mentioned above on Sunday the 28th. This week sees the first of the mens’ Thursday competitions. This is a very social format, with most men teeing off after 5pm. There are usually less formal arrangements than for the Sunday competitions with many players just showing up between 5.30 and 6 and teeing off with whoever else is available at the time. Feel free also to use our WhatsApp group if you would prefer to have a partner arranged in advance. First prize in the Thursday night competition is sponsored by a different member every week with a list on the noticeboard in the clubhouse for those wishing to contribute. RESULTS – Congratulations to Ross Andrew and Paddy McLoughlin who won the Boyle round of the Holmpatrick Cup competition and go forward to represent the club in the next round. Ross and Paddy had 45 points, beating Darragh Loftus and Joe Hussey into 2nd place with 44 points. 3rd place went to Terry Bright and Owen Garvin , also with 44 points. FIXTURES – In a change to the fixture list , next Sundays competition will not be the Fourball Shambles indicated on the fixture list and will be announced during the week. The following week sees 2 noteworthy events for the men; the first of our ever popular Thursday evening 9 hole competitions takes place on the 4th of April, followed by our first “Golfer of the Year” competition , an 18 hole stableford on Sunday the 7th of April. WHATSAPP GROUP – The mens’ WhatsApp group has been relaunched. It is open to all paid-up adult male members of the club, the primary purpose of it being to assist members in finding playing partners, especially new members. For anyone interested who is not already linked in to the group, please text your name and number to 086 6090954. HARRY WYNNE – It was sad news for Boyle Golf Club when word came through of Harry Wynne’s death. Harry had been an active playing member of the club for over half a century and had served the club faithfully in many roles including as Captain in 1985 and President in 1995. He had also featured on the “roll of honour” having won a Presidents Prize in 1986 and had captained and played on inter-club teams. Harry had two qualities which immediately struck people who met him ,which were his unfailing courtesy to others and his very definite sense of style. The Wynne family have contributed much to Boyle Golf Club over the years with Harry’s late brother Tom succeeding him as Captain in 1986, and Harry’s wife Marie having also served both as Lady Captain and Lady President. The club wishes to express our sincere condolences to all the Wynne family . JAMES COOKE – James Cooke was the other thorough gentleman lost to us in recent weeks. James was also a past Captain of Boyle Golf Club (2010) and former inter-club player. He was heavily involved in committee work during his years as a member, where his personal qualities of being hard-working , soft spoken, and level headed were held in high regard. James was a family man and as such was fortunate that his sons shared his interest in the game and a Sunday morning fourball of Cookes became a regular sight at the club. We know that James missed involvement with the club in recent years and we were saddened by news of his far too premature passing. We also wish to express our sympathies to the Cooke family at this difficult time. CAPTAINS DRIVE IN – Congratulations to our captains Seamus Gallagher and Regina McLoughlin for getting the golfing year off to a successful start with the traditional “Drive In” which was held on Sunday the 24th of February. There was a great turnout to support our captains and to take part in the scramble competition that followed. The winning team on the day was that of Terry Canning, Susan O’Mahoney and Willie Tiernan. 2nd place went to Karl Keenan, Mary O’Hara, Gerry O’Dowd and John Cryan and 3rd place to Lorcan Egan, Lionel Lynn and Conor Hamill. CLUB DRAW- The 2 rounds of the club draw for January and February were held after the Drive In and the winners were as follows : January – 1st – Mary McKeon, 2nd Brendan and Susan Gaffney, 3rd Sean Heslin. February – 1st – Pat Conroy 2nd – Vincent and Moira Egan, 3rd – Denis and Mary O ‘Donnell. 1st prize is 70 euro, 2nd and 3rd get 40 euro apiece. 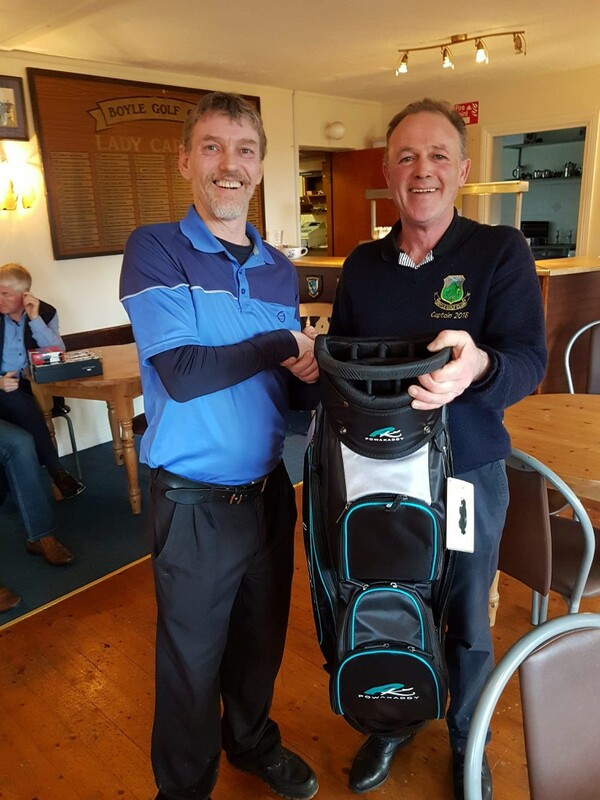 RESULTS – The final round of this years Spring League was played on Sunday the 17th of February and was won by Ross Andrews 39 points, 2nd and 3rd places going to Vincent Egan and Paul Connolly with 38 points apiece. The overall winner of this years Spring League was club treasurer, Paul Connolly, with Willie Tiernan coming 2nd. FIXTURES – The big event in the club calendar for February is the Captains and Lady Captains “Drive-In” on Sunday the 24th of February when captains Seamus Gallagher and Regina McLoughlin will get Boyle’s golfing year off to its official start. We ask all members to come along to this most social of occasions and show support for your captains for the year. The format of the competition itself on the day will be a 9 hole scramble for ladies and gents, a draw for teams will be made on the day, no need for prior arrangements. PRESENTATION OF PRIZES – There will be a presentation after the Drive-In for all prizes from competitions since the 30th of December, please be in attendance if you have a prize to collect. This will include the Sunday competitions, the Spring League and the Drive-In itself. MEMBERSHIP- Members are reminded that fees for 2019 are now due . Membership letters are currently being issued but for anyone wishing to go ahead and pay by online banking, the club account IBAN is IE59BOFI90532822439700, please include your name as the reference. The rates remain unchanged from last year, some of the main membership category prices are – Junior Member (under 18) – 60 euro, 1st year beginner – 170 euro, Under 30 member – 275 euro, Full Single Member – 395 euro, Family Membership – 660 euro, Senior Member – 275 euro, Distant Member Single – 185 euro. A more comprehensive list of the various membership rates is available on the clubs website under “rates” on www.boylegolfclub.com. RULES NIGHT – The club owes Jim Mooney a debt of gratitude for the very informative presentation he gave on the new rules in the clubhouse on Thursday the 17th of January. Jim did a fine job in highlighting some of the changed rules that are likely to catch out players in competitions during the year, which include such fundamental ones such as the new method of taking a drop in a relief situation, to the reduced time now permitted to search for a lost ball. Thanks again to Jim for making himself available and fielding the many queries on the night. RESULTS – The winners of the fourball betterball held on Sunday were the 2 convenors, Willie Tiernan and Vincent Egan, with a fine score of 44 points. Seamus Gallagher and Michael Reid claimed second place with 43 points, just shading Tommy King and Paul Connolly in to 3rd place on countback. FIXTURES – The mens’ competition next Sunday, the 27th of January, is an 18 hole stableford. The Spring League for men and women is on the weekends of the 2nd, 9th and 16th of February. If you are interested in playing please add your name to the list on the noticeboard in the clubhouse by next Sunday afternoon (the 27th). RESULTS – Brendan Gaffney and Jim Mooney were the winners of the foursomes competition held on Sunday the 13th of January. Lorcan Egan and Mark Whelan claimed second place. An 18 hole stableford was held on Sunday the 6th of January and was won by Tommy King with a great score of 41 points, with David Wynne’s 38 points taking 2nd, and Michael Rush coming in 3rd with 38 points.Gary Carty took the prize for best gross score. FIXTURES -The mens’ competition this coming Sunday ( the 20th) is a Fourball Betterball. CLUB DRAW – Recent winners in the monthly club draw are as follows : October – 1st – Jim Mooney, 2nd Ted Hester, 3rd Martin Higgins. November – 1st Peggy Feely, 2nd Margaret Egan, 3rd Seamus and Marie Gallagher , December – 1st Pat Conroy, 2nd Denis and Mary O’Donnell, 3rd – Margaret Egan. 1st prize is 70 euro, 2nd and 3rd are 40 each. NEW RULES – There are a number of new golf rules in place internationally since New Years Day. These rule changes were first proposed and publicised a few years ago so members may be aware of some of them, but the changes are quite extensive and we anticipate several people will unwittingly fall foul of them on occasion throughout the year. To minimise any problems for local players, Boyle member Jim Mooney , who is both a respected GUI tournament referee and Boyle member, was requested by the mens’ committee to do a presentation on the new rules for members of the club. He has very kindly agreed to do this in the clubhouse on Thursday the 17th of January at 8 pm. This is open to all members of the club to attend, men and ladies. We strongly advise members to attend to help reduce the chances of being on the wrong end of the new rules during 2019. RESULTS- The clubs’ Christmas scramble was a great success both in terms of turnout and enjoyment levels. It was played on the 27th of December and the winning team on the day comprised of Terry Canning, John Joe Carty and Jim Callery. In second was the team of Aisling Gaughran, Lorcan Egan and Seamus Gallagher. Third place went to Killian Egan, Gary Carty and Cillian Conboy. Patrick Egan’s 40 points sufficed to win the final competition of 2018, an 18 hole stableford played on Sunday the 30th of December. Paul Connolly had 39 points for 2nd place and prodigal son Willie Tiernan made a very welcome return to the winners enclosure in Boyle Golf Club with 36 points. Gerry Carty claimed the prize for best gross score. An 18 hole stableford was held on Sunday the 6th of January and was won by Tommy King with a great score of 41 points, with David Wynne’s 38 points taking 2nd, beating Gary Carty on countback. NEW RULES – 2019 sees the adoption of some very significant rules changes in the game of golf, which will affect multiple facets of the game including the correct manner to drop a ball, the time allocated to search for a lost ball, the ability to now leave a flagstick in the hole when putting, among many others. The overall aim of these rules was to both simplify the game and to speed up play, but given the scale of the changes it is inevitable that people will incur penalties during 2019 for unwitting breaches of the rules. Boyle member Jim Mooney , who is a respected GUI tournament referee , was requested by the mens’ committee to do a presentation on the new rules for members of the club. He has very kindly agreed to do this in the clubhouse on Thursday the 17th of January at 8 pm. This is open to all members of the club to attend, men and ladies. We strongly advise members to attend to help reduce the chances of being on the wrong end of the new rules during 2019. Michael Simon was the winner of the 18 hole stableford played on Sunday the 9th of December with 36 points, and Pat Conroy’s 35 points were good enough for second place. The clubs Christmas Bonanza competition for men and ladies was played on Sunday the 16th. The overall winner this year was Jimmy Dwyer who had 40 points, beating Terry Canning on countback. Gerry Carty came 3rd prize and Patrick Egan added another gross prize to his collection. Our new Lady Captain, Regina McLoughlin, was the winner of the ladies first prize. A number of other prizes were also presented on the night , most notable being the presentation of the Stafford King Harmon Perpetual Cup to the winner of the club’s annual matchplay competition, Mark Whelan. This cup has been competed for within the club since 1942. A few months of the club draw were also held with the following winning cash prizes ( 70 euro for first , 40 euro each for second and third). October 2018 – 1st Jim Mooney, 2nd Ted Hester, 3rd Martin Higgins. November 2018 – 1st Peggy Feely, 2nd Margaret Egan, 3rd Seamus and Marie Gallagher. December 2018 – 1st Pat Conroy, 2nd Denis and Mary O’Donnell, 3rd Margaret Egan. Upcoming fixtures include the Christmas Scramble for ladies and gents on Thursday the 27th of December ( the day after St Stephens Day). This is a very social golf event and all members ( and golfing visitors) are welcome to attend and take part. Names need to be in for the draw at 12.45 pm with a shotgun start at 1 pm. RESULTS – Tom Kearney continued his exceptional run of form by winning the 18 hole stableford competition played on Sunday the 25th of November . Tom had 40 points, with Sean Heslin’s 38 and Pat Conroy’s 37 taking the second and third places. Charlie O’Donnell made a return to winning ways by claiming the best gross score with 36 points. The 18 hole stableford played on Sunday the 18th was won by Sean Heslin by 37 points, separated only from Gerry Carty’s 37 by “countback”. Tom Kearney’s 36 points was good enough for third place. UPCOMING – Next Sunday’s mens’ competition will be an 18 hole stableford. The overall club AGM also takes place the same Sunday, the 2nd of December , in the clubhouse at 5 pm and the other significant event on the horizon is the Christmas Bonanza competition for both men and ladies which takes place on the 16th of December. LADIES AGM – The AGM of the ladies section of the club was held on Sunday the 18th of November. Regina McLoughlin is the incoming Lady Captain for 2019 and her committee will comprise of : Hon Secretary – Moira Egan, Handicap Secretary – Susan O’Mahony , Competition Secretary – Mary O’Hara, Treasurer – Liz Dwyer, with the following serving as ordinary committee members : Fiona Keenan, Therese O’Daly, Tish Perry and Marie Hanmore-Cawley. Geraldine McDermottroe will be Lady President for 2019. The overall club AGM takes place on the 2nd of December at 5 pm in the clubhouse. KING HARMON – This years King Harmon Trophy has been won in fine style by Mark Whelan, who faced a very formidable opponent in the final, mens’ captain Terry Canning. Although Mark has been playing golf for a few years now, this was his first year as a member of Boyle Golf Club and he will be the envy of many who have spent decades trying to win the singles matchplay tournament. The only downside for our new winner is that the annual handicap review happens shortly and rumour has it that he’s first for the chop! Well done Mark. FIXTURES – The competition next Sunday the 25th will be an 18 hole stableford. Our weekly 9 nine hole winter competition continues this week and can be played Monday to Saturday. Other upcoming competitions include the ever popular Christmas Bonanza on Sunday the 16th of December. RESULTS – An 18 hole stableford was played on Sunday the 18th, result will follow next week. RESULTS – The 18 hole stableford played on Sunday the 6th of November was won by Brendan Gaffney with a fine score of 43 points, Patrick Egan was second with 40 points, Terry Bright claimed the gross with 37 points and Tom Kearney was third with 38 points. Another 18 hole stableford was played on the following Sunday, the 11th , and the winner on this occasion was Dave Purser with 40 points, beating the 37 points of Michael Rush in to second place. Lorcan Egan took the gross with 37 points and Sean Heslin was third with 36 points. FIXTURES – Our winter 9 hole competition continues this week and can be played any day from Monday to Saturday with unlimited re-entry also available. The competition for Sunday the 18th will be an 18 hole stableford. KING HARMON – The King Harmon matchplay competition is almost at an end for 2018 with just two men left standing – outgoing captain Terry Canning and new member Mark Whelan. Both men have claimed some notable scalps on their way through the tournament, but only one man will see his name engraved on to the base of the King Harmon Cup for this year. The tournament has been a fixture for several decades within the club and is one of the most sought after prizes of the golfing year in Boyle. MENS’ AGM – The AGM of the mens’ club was held on Sunday the 11th. Captain Terry Canning thanked his committee for their support during 2018 and also thanked the men who had volunteered in any capacity for the club during the year and also those involved with interclub teams. He was happy to note that the construction of the new shed had gone well and was expected to be concluded in the coming weeks. He wished every success to the incoming mens’ captain for 2019, Seamus Gallagher. Martin Wynne’s report as Secretary included thanks for the support he had received from Terry and also some of the other officers of the men’s club during the year, particularly from Michael Rush in his capacity as Competition Secretary. He noted that Michael Rush had made a very successful change to the sponsoring of Sunday competitions this year which involved local businesses who had traditionally contributed sponsorship to the clubs Open Week to instead sponsor a particular Sunday during the year, thus ensuring good local media mentions for these businesses throughout the year. The meeting agreed to enter the same number of interclub competitions in 2019 as in 2018. On a related note Vincent Egan proposed that interclub team captains undertake responsibility for co-ordinating the catering on the day of a match. This motion was carried.There was a discussion about the proposed merger of the ILGU and the GUI and the changes this may entail within the club. The following comprise the officers of the mens’ committee for 2019 : – President- Sean Heslin, Captain – Seamus Gallagher, Secretary – Jim Mooney, Competition Secretary – Lorcan Egan, Handicap Secretary – Gerry O’Hara, Treasurer – Liam Mullaney, Communications – Jonathan Egan. The ordinary committee members are Willie Tiernan, Brendan Gaffney, Pat Conroy, Terry Canning, Patrick Egan, Vincent Egan, Paul Connolly, Gary Carty, Shane Loftus, Shane O’Dowd, Michael Simon and Tommy King. LADIES AGM – The AGM of the ladies’ section takes place in the clubhouse at 5 pm next Sunday the 18th of November. The Drumderrig Cup was played over the October Bank Holiday Weekend in perfect conditions both underfoot and overhead. The winning team this year comprised of Lorcan Egan, Cillian Doyle, Jonathan Egan and Paddy McLoughlin with 103 points. In second place were Brendan Gaffney, Sean Heslin, Vincent Egan and John Cryan with 98 points, and third place went to Terry Bright, Martin Wynne, David Wynne and Owen Garvin with 96 points. Thanks again to Paula Cull for her generous sponsorship of this competition. The King Harmon matchplay is well underway with the and the field has been narrowed to the four semi-finalists. Mark Whelan continued a recent run of form with a good win over a strong opponent in his quarter-final and will be playing his semi-final against Brendan Gaffney. The other semi-final will be played between Terry Canning and Liam Mullaney. The two semi-finals are to be played this week with the final the following week. The winter 9 hole competition continues this week and can be played any day from Monday to Saturday. Owen Garvin was the winner in the week before Halloween with 21 points. The competition on Sunday the 4th of November was an 18 hole Stableford sponsored by Ivan Keaney Photography, Bridge Street, Carrick on Shannon. Results to follow next week. Thanks again to Ivan Keaney for his sponsorship. The mens’ competition next Sunday the 11th of November is an 18 hole stableford. The mens’ WhatsApp group has been temporarily taken down. It will be relaunched again in the coming weeks when a few adjustments have been made. The mens club AGM takes place on Sunday the 11th of November at 5pm, with the overall club AGM taking place on Sunday the 2nd of December, also at 5 pm. RESULTS – The men’s competition on Sunday the 30th of September was an 18 hole stableford sponsored by Golfstyle, Ireland’s leading golf shop based in the Liosban Business Park, Tuam Road, Galway. Jimmy Dwyer was the emphatic winner with a fine score of 41 points, leaving the respectable 38 points of his playing partner Dave Purser a distant second. Tom Kearney claimed the final spot on the podium with 37 points. Thanks very much to all at Golfstyle for their continued generous sponsorship. The King Harmon Cup commenced this weekend in its new format. Traditionally played for as a matchplay (“knock out”) competition over several months, this year it is being competed for over the first 3 weekends in October in 18 hole stableford format, with a players 2 best cards out of the 3 weeks being combined to give his total. If 2 or more cards tie for first place, ties will be decided on the best third card. The top 8 scores then participate in 3 rounds of matchplay to decide an overall winner. Each round can be played on either Saturday or Sunday of its respective weekend. The highest scorer in the first round was Dave Purser. In a continuation of his good from, Dave had 40 points, beating Sean Heslin’s 38 in to second with Terry Canning claiming the third spot with 36 points. The overall scores were lower than average, reflecting the difficult weather conditions, which may suit those who were unable to play this weekend and are hoping to play in the next 2 rounds. FIXTURES – The Winter 9 hole competition made its return this past week. The format is a 9 hole stableford running Monday to Saturday inclusive on a weekly basis, entry is 5 euro, re-entry is 3 euro. This competition runs throughout the winter, weather and course conditions permitting. It has proved very popular since its introduction a few years ago especially with those who have more free time on weekdays than they do at weekends. If you are looking to play but don’t have playing partners arranged, just put up a message on the mens’ WhatsApp group with your preferred time. RESULTS – The three prize-winners in the mens’ midweek stableford competition all had 20 points and were only separable by “countback” with Brendan Gaffney taking first place, just edging Tom Kearney and Jim Callery into the runners-up spots. COUNTY CUP – Well done to our friends and neighbours in Ballaghaderren Golf Club for being the originators and driving force behind the “County Cup”. It is only fitting that they were also the first winners of the competition which was held on Saturday the 8th in Ballaghaderreen. Boyle Golf Club looks forward to hosting it next year and hope we can do as good a job as Ballaghaderreen did in 2018. Thanks also to the Roscommon Herald for sponsoring the competition. FIXTURES – The mens’ midweek 9 hole stableford will continue for the next few weeks. Sunday competitions for the next few weeks for the men will include an 18 hole strokeplay next Sunday the 16th followed by 18 hole stablefords on the 2 subsequent Sundays. ARRIVALS- The club extends hearty congratulations to the Smith, Egan and Keenan families who have all had babies in the past few weeks and hopes to see all 3 children making their presence felt in the club in the years to come! RESULTS – It has been a great few weeks for the younger golfers of the club with Lewis Shaw winning the Strokeplay competition held last Sunday the 12th with a great score of 62 nett, followed this week by Ciaran Beirne who had his first big win in the club on Sunday the 19th, claiming the James Shivnan Memorial Cup with an unbeatable 44 points with yet another young golfer, Cillian Doyle, taking second place with 42 points. Well done to all three, who will surely be hard to overlook for places on interclub teams in 2019 if they continue to bring in such strong scores. Other prizes in the James Shivnan Memorial competition went to Charlie O’Donnell who took the prize for best gross score and Tom Kearney who came 3rd , continuing a recent run of form, as he was also the winner of the 12 hole Stableford competition held on Thursday the 16th with 28 points, beating Michael Simon and Lorcan Egan in to 2nd and 3rd respectively, all 3 having 28 points and separated only on “countback”. FIXTURES – The competition next weekend is our annual fundraiser for the Boyle Town Traders played in 4 ball Shambles format, with 2 scores to count per hole on the front 9 holes and 3 per hole on the back 9. The mens’ Thursday competition reverts from 12 holes to 9 from this week. INTERCLUB – Good luck to our Connacht Shield team who take on Ballina Golf Club this week in the second round. RESULTS – A fundraiser competition for the club was played over the August Bank Holiday Weekend. The winning team was that of Ross Andrew, Tommy King and Eamonn Perry with a fine score of 102 points, just pipping the second placed team on countback. In second were Pat Conroy, Michael Rush and Tom Kearney. Michael and Tom also featured on the third placed team in their their other appearance in the competition, this time accompanied by Sean McLoughlin. Countback was a popular method of deciding competitions in the club in the last while with the the three top scorers in the Mens 12 Hole Stableford held on Thursday the 9th all having 27 points. The winner was Paul Connolly, beating Owen Garvin and Michael Simon in to 2nd and 3rd respectively. INTERCLUB – Well done to the men’s Connacht Shield team who beat neighbours Ballaghaderreen in a closely fought first round match. Credit is especially due to Patrick Egan and Terry Canning who secured the all important away win in Ballaghaderreen. The team is captained by Lorcan Egan and they now face Ballina in the second round. CLUB FOURSOMES – The club’s Foursome Matchplay competition concluded during the week. Congratulations to Vincent Egan and Tom Kearney who edged out Patrick Egan and Padraig O’Connell in the final. JAMES SHIVNAN MEMORIAL CUP – Our annual competition to commemorate James takes place next Sunday. It is an open competition for a perpetual trophy played as an 18 hole Stableford. Online booking is available at boylegolfclub.com , entry fees are 10 euro for members, 15 for visitors. CAPTAINS PRIZE 2018 – Well done to Brendan Gaffney who is the winner of the Captains Prize for 2018. Padraig O’Connell made a valiant effort to thwart Brendan’s attempt at a third Captains Prize, having been 3 shots behind him going into the 9 hole play off and closing the gap to 1.5 shots, but it was not to be. Brendan was presented with his prize by the captain, Terry Canning, in a presentation in the clubhouse on Sunday night. It was great to see both a strong turnout on the day and a number of new faces playing in their first Captains Prize. The other prize winners were as follows – Best Gross Score- Charlie O’Donnell , 3rd – Tom Kearney, 18 nett – Pat Conroy, Past Captain – Jim Mooney, Seniors Prize – Vincent Egan , Category 0-15 – Michael Simon, Category 16-20 – Kevin O’Connor, Category 21-28 – Tommy King, First Nine – Sean Heslin, Second Nine – Lewis Shaw, Third Nine – Michael Gilmartin, Student Prize – Cillian Doyle. CAPTAINS PRIZE TO THE LADIES – 1st – Mary O’Hara, 2nd – Susan O’Mahoney, Best Gross – Liz Dwyer, 3rd – Ruth Hogg. MENS MIDWEEK COMPETITION – The winner of the men’s mid week competition on Thursday the 26th was the evergreen Ted Hester. Ted employed his wealth of golfing experience to bring in a fine score of 28 points and thus become the appreciative owner of a bottle of Hennessy. INTERCLUB – The men of Boyle Golf Club take on neighbours Ballaghaderreen on the Monday of the bank holiday weekend. The captain of the team this year is Lorcan Egan and he asks that anyone interested in being considered for selection to get in contact with him during the coming week. LADY CAPTAINS PRIZE – Mary O’Hara was the winner of this years Lady Captains Prize, played on Sunday the 15th of July. Mary and the other prize winners were presented with their prizes by this years Lady Captain, Marie Hanmore-Cawley at a presentation in the clubhouse that evening. The list of winners is as follows – 1st – Mary O’Hara, 2nd – Peggy Feely, Best Gross Score – Liz Dwyer, 3rd, Carmel McGarry, Category A- Tish Perry, Category B-Mandy Toolan, Category C – Geraldine McDermottroe, Pats Captain – Kathleen Candon, Front Nine – Moira Egan, Back Nine- Ruth Hogg, Best Visitor- Margaret Cox, 9 hole competition – Criona O ‘Donnell. LADY CAPTAINS PRIZE TO THE MEN – 1st – Vincent Egan 38 points, 2nd – Eamonn Perry 37 points, Best Gross Score – Charlie O’Donnell, 3rd – Tom Kearney. MENS MIDWEEK COMPETITION – The 12 hole stableford played on Thursday the 19th was won by Gerry Carty with 29 points, in second was Tom Kearney with 28 and back in the winners enclosure after a few months absence was Cillian Doyle, taking third place with 27 points. The “2s club” was won by Gerry Carty. INTERCLUB – The men of the club recorded a good win over Ballinamore in the first round of this years Jack O’Sullivan Trophy. The team is ably captained by Charlie O’Donnell. JAMES SHIVNAN MEMORIAL CUP – James Shivnan was a very popular member of Boyle Golf Club and since his untimely passing we have played an annual competition for a perpetual trophy in his honour. This years competition will be an 18 hole stableford taking place on Sunday the 19th of August with an entry fee of 10 euro for members and 15 euro for visitors. Online booking is available at www.boylegolfclub.com. CAPTAINS PRIZE –The biggest event of the year for the male golfers of the club is almost upon us with Terry Canning’s Captain’s Prize for 2018 taking place on Sunday the 29th of July. The competition will consist of an 18 hole strokeplay, with the best scorers qualifying for a 9 hole play-off later that evening with presentation of prizes taking place shortly after the end of the play-off. Online booking has opened for this competition with several of the earlier tee-times reserved already. OPEN WEEK – The club held a very successful Open Week from Monday the 2nd to Friday the 6th of July. All competitions during the week were well supported, aided by the superb weather conditions. The presentation of the week’s prizes was held on Friday evening in the clubhouse directly after receipt of all cards for the last competition of the week. The club held a barbecue in conjunction with the presentation and we wish to convey our gratitude to Boyle and District Angling Club for the use of their equipment, which was operated by the very capable Jordan Maye. Terry Canning, captain of the men’s section , thanked several people in his speech, but paid special tribute to the volunteers who keep the course and clubhouse ticking over. In particular, he thanked Michael Rush for the enormous effort he had put in over preceding weeks that ensured a successful staging of all scheduled competitions. Terry also thanked the businesses of Boyle town and the surrounding areas without whose generous sponsorship there would be no Open Week. Monday -Ladies 9 hole Strokeplay – 1st Anna Smith, 2nd Tish Perry, Gross – Moira Egan, 3rd Kathleen Candon, Visitor – Valerie Quinn. Gents 9 hole Stableford – 1st Paddy Egan, 2nd Vincent Egan, 3rd Lorcan Egan, Visitor Seamus Connolly. Wednesday – Ladies and Gents 9 hole Stableford 1st – Michael Simon, 2nd Valentin Mirt, 3rd Seamus Gallagher, Visitor Mary O’Rourke. Mixed Foursomes – 1st Paddy Egan/Carmel McGarry, 2nd Colm Loftus/Kathleen Candon, 3rd Darragh and Margaret Loftus, Visitor Jonathan Egan/Lizzy O’Sullivan. Friday – 3 ball Scramble – 1st Brendan Gaffney/Susan O’Mahoney/Daniel Casey, 2nd Terry Canning/Seamus Gallagher/Marie Gallagher, 3rd Patrick Egan/Jonathan Egan/Paddy McLoughlin, Visitors Anna Smith/Michael Masterson/Dermot Monaghan. Some notable prize winners were Valentin Mirt and Daniel Casey winning their first ever prizes and Conor Hamill winning his first “trophy” competition, it’s always great to see new challengers making their presence felt. Our lady captain, Marie Hanmore-Cawley presented mens’ captain Terry Cannng with a bottle of brandy on behalf of the club to celebrate his “hole in one” in the mens’ competition on Thursday. SUMMER SHOW FUNDRAISER – An 18 hole Stableford fundraiser for Boyle Horse and Summer Show was held on Saturday the 30th of June. 1st place – Seamus Gallagher 38 points, 2nd Michael Gilmartin 36 points, 3rd place Conor Hamill 34 points. GEELAN TROPHIES COMPETITION – Frank Geelan sponsored an 18 hole Stableford competition on Sunday the 1st of July which was own by Shane Loftus with 39 points, in 2nd was Sean Mcloughlin with 37 and Charlie O’Donnell came 3rd with 36 points. GOLFSTYLE COMPETITION – Golfstyle , who are based in the Liosban Industrial Estate just off the Tuam Road in Galway, kindly sponsored our mens’ 18 hole Strokeplay on Sunday the 8th of July. 1st – Gerry O’Hara, 2nd – Ross Andrew, Gross – Lorcan Egan, 3rd -Vincent Egan. FIXTURES – The biggest event for the coming week is Lady Captains weekend, commencing with a Scramble next Friday to which all members are invited. There will be an 18 hole competition for the men on Sunday the 15th, but the most important competition of the day is of course the Lady Captains Prize, which is the biggest event of the year for the ladies of the club. This years lady captain is Marie Hanmore-Cawley. RESULTS – The mens’ 12 hole stableford played on Thursday the 28th of June was won by Jonathan Egan, with Michael Gilmartin and Padraig O’Connell coming in 2nd and 3rd. The “twos club” pool was split between Jonathan Egan and Michael Gilmartin. The results of the competitions played on the weekend 30th of June and the 1st of July will be published next week. FIXTURES – We are currently in the middle of our Open Week with competitions for ladies and gents taking place each day from Monday the 2nd of July to Friday the 6th. Highlights include Ladies Day on Tuesday, the Mixed Foursomes on Wednesday, an 18 hole strokeplay for the men on Thursday and a threeball scramble on Friday. There are also 9 hole competitions taking place most days in addition to the main 18 hole competition. Further details can be found on our website www.boylegolfclub.com or our Facebook page “Boyle Golf Club”. We will hold a presentation night and barbeque on Friday the 6th of July. COURSE WORK – The club owes a debt of gratitude to the volunteers who have been up at the course after dark night after night watering greens during the recent dry spell. Without their freely given labour the greens would have been badly damaged and possibly rendered unplayable for our Open Week. Thanks to all involved. RESULTS – Lorcan Egan was the winer of the mens’ midweek 12 hole stableford competition held on Thursday 21/6 with a score of 26 points. Patrick Egan and Paul Connolly took 2nd and 3rd place with 24 and 22 points respectively.. The 18 hole strokeplay competition that took place on Sunday the 24th was sponsored by mens’ president Michael Simon’s business Cleansave, for which the club extends its gratitude to Michael. This competition was won by Gerry O’Hara’s fantastic 61 nett, which was a full 5 shots clear of second placed Seamus Gallagher’s 66. Seamus edged out third placed Frank Casserley’s 66 on countback and Niall Sweeney claimed the prize for best gross score. FIXTURES – Upcoming competitions for this week include the usual mens’ midweek 12 hole stableford competition on Thursday and a fundraiser competition for the Boyle Horse and Summer Show this coming Saturday the 30th of June. The show is chaired by club member Fiona Keenan. The format of the fundraiser will be an 18 hole stableford. Next Sunday the 1st of July sees an 18 hole stableford competition sponsored by Boyle business Frank Geelan Trophies. The club thanks Frank for sponsoring this competition and his ongoing sponsorship over the years. OPEN WEEK – One of the main events of the golfing year in Boyle starts next week when our “Open Week” tees off with 9 hole strokeplay competitions on the Monday for ladies and gents, followed by “Ladies Day” on the Tuesday with an 18 hole stableford competition for the ladies and a 9 hole stableford for the men taking place. Wednesday sees the ever popular Mixed Foursomes Competition. There are also ladies and gents 9 hole stableford competitions on that Wednesday. On Thursday there will be an 18 hole strokeplay competition for the men and a 9 hole stableford for the ladies, whilst the final competition of the week will be an 18 hole “3 ball Scramble” on the Friday. Provisionally, we are planning to host a presentation of prizes and barbeque night on that Friday and to catch up with some much overdue instalments of our monthly draw! RESULTS – In the mens’ mid week 12 hole Stableford held on Thursday the 14th of June, Brendan Gaffney emerged as the winner with 29 points, edging out the 28 points had by Padraig O’Connell. Conor Hamill took 3rd place with 27 points. The “Twos Club” money was split between Michael Gilmartin and Terry Canning. FIXTURES – An 18 hole Strokeplay competition will take place for the men next Sunday the 24th of June, with the women competing in the “Australian Spoons” competition. A fundraising competition takes place on Saturday the 30th of June with the proceeds going to the Boyle Horse and Summer Show. Also occurring that weekend on Sunday the 1st of July is an 18 hole Stableford competition for the men, for which “Golfer of the Year” ranking points will be available. OPEN WEEK – Our “Open Week” is taking place this year from Monday the 2nd of July to Friday the 6th with competitions on each of the days, open to both members and visitors. The week commences with 9 hole Strokeplay competitions on the Monday for ladies and gents, followed by “Ladies Day” on the Tuesday with an 18 hole Stableford competition for the ladies and a 9 hole Stableford for the men taking place. Wednesday sees the ever popular Mixed Foursomes Competition. There are also ladies and gents 9 hole Stableford competitions on that Wednesday. On Thursday there will be an 18 hole Strokeplay competition for the men and a 9 hole Stableford for the ladies, whilst the final competition of the week will be an 18 hole “3 ball Scramble” on the Friday. PRESIDENTS PRIZE – Well done to club stalwart Jimmy Dwyer who is the winner of the Presidents Prize for 2018. Jimmy had a great finish to win, chipping put of a sand bunker beside the final play-off hole to leave his ball within 6 inches of the pin. The presentation of prizes took place in the clubhouse shortly after the conclusion of the play-off. President for 2018 Michael Simon thanked the many club volunteers who contributed in various ways to the day. The results were as follows – 1st Jimmy Dwyer, 2nd Terry Canning, 27 gross Gary Carty, 3rd Paddy McLoughlin, 18 nett Michael Bannon ,Senior prize Pat Conroy, Past president Charlie O’Donnell, Category 0-13 Martin Wynne, Category 14-19 – Shane Loftus, Category 20-28 Gerry O’Hara , First Nine Ross Andrew , Second Nine Lorcan Egan, Third Nine Vincent Egan. In the Presidents prize to the ladies, the prize-winners were as follows – 1st Regina McLoughlin, 2nd Mary O’Hara, Ladies Gross Tish Perry, Ladies 3rd Moira Egan. KING HARMON CUP – Congratulations to Brendan Gaffney who is the winner of the 2017 King Harmon Cup , edging out Gerry O’Hara in the final this weekend. COURSE WORKS – Well done to all the volunteers who turned out for our “Divot Day” this Saturday who performed sterling work in repairing divot marks on all the fairways. Players may notice that the grass is slightly longer on the greens than usual, this is a deliberate decision by the course committee to protect the playing surfaces from scorching in the recent dry weather. FIXTURES – Next Sunday, the 17th of June sees a Fourball Betterball competition for the men with the ladies competing for the Warren Cup. On the following weekend the men play an 18 hole Stroke whilst the ladies play in the exotically titled “Australian Spoons” competition. CONDOLENCES – The club bade farewell this week to Jimmy Doyle. Jimmy was a past Captain, President and Treasurer of Boyle Golf Club and was held in high regard within the club. Jimmy was known for several things, including his love of a competitive fourball, spinning yarns, and most famously his ability to cut a dash in the tailoring department. He was greatly missed by his fellow golfers when he had to stop playing due to illness a few years ago. The club extends its sincere condolences to Pauline and family. We also wish to offer our condolences to Michael, Bridie and all the McHale family on the recent passing of Deirdre McHale. RESULTS – At the time of writing the club’s Bank Holiday Scramble was taking place, results will be published next week. The mens’ Thursday 12 hole Stableford played on the 31st of May was won by Ross Andrew with a fine score of 30 points, Eamonn Perry was second with 28 points. INTERCLUB – We wish the very best of luck to our Mixed Foursomes team who take on Strandhill Golf Club this week in the second round of the Irish Mixed Foursomes Tournament. UPCOMING – Michael Simon is the President of the mens’ section this year and his big day takes place next Sunday the 10th of June in the second of this years “majors”. The Presidents Prize is played as an 18 hole Strokeplay competition in the first part of the days action, with the best scores of the day invited back for a 9 hole play-off later in the evening. The presentation takes place in the clubhouse directly after the conclusion of the play-off. Online booking is essential for this competition. As part of the Presidents Prize weekend, there is a social 9 hole Scramble on the evening of Friday the 8th of June which is open to all members of the club. There is no need to arrange partners or teams for the scramble, just turn up before 18.30 to have your name in for the 18.45 draw. JUNIOR GOLF – Junior golf continues this Wednesday the 6th of June at 6 pm. All children 8 years of age or older and interested in learning the basics of the game are welcome. All equipment will be provided. MEMBERSHIP – Please check our website www.boylegolfclub.com for details of our competitive membership rates, including greatly reduced rates for those taking up the game for the first time. RESULTS – The mens’ Thursday 12 hole Stableford played on the 24th of May was won by Vincent Egan with a score of 27 points, just edging out Michael Gilmartin and Lewis Shaw who both had 26 points. A fundraising competition for Boyle Courthouse was played on Saturday the 26th and was won by Niall Kearney with 38 points. Second place went to Paul Connolly who also had 38 points, Brendan Gaffney took the best gross score prize and Pat Conroy came third. The Bart Moran Cup, sponsored by Aidan Ray Menswear, was played on Sunday the 27th of May and was won by Gerry O’Dowd, who continued a run of form with a great score of 63 nett. Second prize went to Michael Simon with 68 nett, beating Vincent Egan on count-back. Charlie O’Donnell claimed the prize for best gross score. The ladies competition on the same day was for the Dr Niamh Nangle Cup, which was won this year by Moira Egan, with Claire Cryan coming second. INTERCLUB – Congratulations to Tish Perry’s Mixed Foursomes team who had a good win against Castle Dargan in the first round of the Irish Mixed Foursomes Competition and we wish them all the best in the next round against Strandhill. UPCOMING COMPETITIONS – On the 10th of June, the Presidents Prize to the men takes place, the format being an 18 hole Strokeplay, with the players with the best scores taking part in a 9 hole play-off later the same evening. The competition planned for next weekend was to be a mixed foursomes competition for the Boyle Motor Works Cup, but at the time of writing it appeared that this competition may have to be postponed. If this is the case, details of any replacement competition will be posted on the clubs Facebook page and website during the week. JUNIOR GOLF – The clubs Junior Golf programme kicks off for the year this coming Wednesday the 30th of May at 6 pm. This is open to all boys and girls from 8 years upwards interested in learning the basic skills of the game. There is no need to bring any golf equipment, everything necessary will be provided. RESULTS – The PGA Tankard 18 hole Stableford competition played on Sunday the 20th was won by Gerry O’Dowd with a great score of 42 points. Terry Canning continues a recent run of form taking second place with 37 points, just beating Pat Conroy’s 36 into third. Patrick Egan claimed the gross prize. This competition was sponsored by Jonathan Egan. INTERCLUBS – Hard luck to the mens’ interclub teams who exited from the Connacht Seniors’ and All Ireland Fourball competitions this week. Next up on the interclub scene is Boyle versus Castle Dargan this coming Wednesday in the Irish Mixed Foursomes tournament. UPCOMING COMPETITIONS – Next weekend is another busy one in the club, with the Courthouse Fundraiser being played on Saturday the 26th of May. The format has changed this year to an 18 hole Stableford, i.e it is being played as a singles event, not a team one. This competition aims to raise money for the ongoing works in the old courthouse in Boyle, which is being re-developed by a committee of local volunteers. It will serve as the permanent home for the “Boyle Model Railway”. On Sunday the 27th the annual Bart Moran Trophy competition takes place, sponsored this year by Gerard Sheerin of Aidan Ray menswear, Patrick Street, Boyle. The club thanks Gerard for his support and asks all members to support our sponsors. The following weekend sees the Boyle Motor Works Cup Mixed Foursomes’ competition take place, followed by the President’s Prize for the men on Sunday the 10th of June. RESULTS – The Committee Cup was held over the weekend of the 12th and 13th of May, the format being 18 hole strokeplay for men and women with a 9 hole play off taking place on the Sunday evening for the select few who scored well in the first 18. It was great to see some new faces, well done especially to Iosif and Valentin who played in their first “major”. This competition was sponsored by our good friends from Golfstyle golf shop, who are based in the Liosban Industrial Estate just off the Tuam Road in Galway city. We are very grateful for their sponsorship and encourage our members to pay them a visit when in Galway. This years Committee Cup winner overall winner was Terry Canning, with a great score of 98.5 nett for the 27 holes. Sean Heslin took second place for the men and second for the ladies went to Tish Perry. The gross prizes went to Lorcan Egan for the men and Mary O’Hara for the women. The mens’ and ladies’ 3rd prizes went to Frank Casserley and Sandra McCrann with the overall 18 nett claimed by Paul Connolly. Category prizes went to Charlie O ‘Donnell for the 0-15 category, the 16-22 prize to Seamus Gallagher, and Claire Cryan taking the 23-36 category. The past winners category was won by Cian Smith and the prizes for 1st,2nd and 3rd nines went to Vincent Egan, Liam Mullaney and Patrick Egan respectively. The Committee Cup scramble took place on Friday the 11th, the winners being the team of Brendan Gaffney, Conor Hamill and Seamus Gallagher. The mens’ mid week 12 hole stableford competition played on Thursday the 10th saw those in 1st,2nd and 3rd place all having 26 points , separated only on countback. Ross Andrew was the winner, followed by Lorcan Egan and Michael Gilmartin. UPCOMING COMPETITIONS -Next Sunday sees the mens’ PGA Tankard 18 hole stableford and also the mens’ Presidents Prize to the ladies. On the following weekend the men play for the Bart Moran Cup, sponsored this year by Gerard Sheerin of Aidan Ray menswear in Boyle, for which we are very grateful. INTERCLUBS – We are currently in the busiest part of the season for interclub matches, with 2 more mens teams representing the club in different tournaments and one of the ladies teams. On Wednesday, Eamonn Perry’s Seniors team are playing against Strandhill and on Saturday Pat Conroy’s All Ireland Fourball team take on Castle Dargan. HANDICAP RULE CHANGES – The Connacht Council of the GUI recently passed a rule regarding cards not being returned by players participating in qualifying competitions. The practice up to now is that these players were automatically awarded 0.1 of a shot back for handicapping purposes, but this will no longer be the case. The mens’ committee encourages all players to return their cards in qualifying competitions from now on to ensure that the integrity of our handicapping system is preserved. INTERCLUB MATCHES – Pat Conroy’s All Ireland Fourball team had another great result this week with a fantastic win over Strandhill Golf Club. Michael Gilmartin and Shane Loftus had a fine win at home in their match, but the 2 pairings of Owen Garvin with Tom Kearney and Paul Conolly with Paddy McLoughlin pulled off the considerable achievement of winning their matches away in Strandhill, always a tough ask for golfers from an inland course such as ours. Their next opposition will be either Castle Dargan or Tubbercurry depending on the outcome of their match. Our Seniors team were not as fortunate, suffering a narrow loss to Ballinamore. The interclub matches are coming thick and fast with our first round match in the Pierce Purcell Shield teeing off next Saturday against Ballina Golf Club. UPCOMING COMPETITIONS – Next weekend sees the so called “third major”, the Committee Cup. This competition is open to both men and women, the format being 18 hole Strokeplay with the best scores going in to a 9 hole play-off next Sunday evening. The mens’ PGA Tankard competition takes place on Sunday the 20th. RESULTS – At the time of writing, the annual fundraiser for Our Ladys Hospital Crumlin was taking place, the “Crumlin Classic” with results to follow next week. This competition was sponsored by local Boyle business, Betterbuys/Surprises, and the club is very grateful for their generous sponsorship. We would be grateful if all members make an effort to support our sponsors during the year. The mens’ midweek competition on Thursday the 3rd was won by Conor Hamill with 20 points, Sean Heslin was second with 19 and Vincent Egan came third with 18 points. COMPETITION RESULTS – An 18 hole Strokeplay competition took place on Sunday the 29th of April with first prize being the sought after “Voucher” for a years free membership. This year Cian Smith prevailed with a fine score of 62 nett, beating Brendan Gaffney into second with 65. Lorcan Egan won the prize for best gross score and Tom Kearney came third with 66 nett. Tom’s business, “Quality Meats”, which is based in the Wine Street car park in Sligo, was the sponsor of the competition. The club thanks Tom for his generous sponsorship. The mens’ 12 hole competition which took place on Thursday the 26th was won by Michael Simon with 27 points, just pipping Brendan Gaffney’s 26 points. Gerry Carty took third place with 24 points. FIXTURES – The coming week sees a lot of golf taking place on the course, with the men taking on Ballinamore in the “Connacht Seniors Tournament” on Wednesday the 2nd, the mens’ 12 hole weekly competition taking place on Thursday as usual, followed by the “Crumlin Classic” competition taking place from Saturday the 5th to Monday the 7th. This will be played as a Threeball Rumble. Also on the Saturday of the same weekend, another of the mens’ interclub teams, the “All Ireland Fourball” team, are playing Strandhill in the second round of this competition. KING HARMON CUP – The epic that was the 2017 King Harmon Matchplay competition is coming near an end with news that the final pair left standing are Gerry O’Hara and Brendan Gaffney. The club wishes the best of luck to both gentlemen and urges them to play the final before the commencement of the 2018 competition! INTERCLUB – Well done to the Boyle men who had a noteworthy 4-1 victory over Ballinamore in the first round of the All Ireland Fourball on Saturday the 21st. Congratulations most especially to Seamus Gallagher and Michael Gilmartin who pulled off a victory away from home in Ballinamore and also to Pat Conroy who stepped in at short notice to manage the team. The team members were Vincent Egan, Jimmy Dwyer, Padraig O’Connell, Michael Rush, Tom Kearney, Owen Garvin, Paddy Nangle, Paddy McLoughlin, Seamus Gallagher and Michael Gilmartin. The team will be meeting Strandhill in the next round on the 5th of May. Of note, Boyle take on Ballinamore again in a different tournament, the Connacht Seniors Tournament, on the 2nd of May. COMPETITION RESULTS – A mens Scotch Foursomes Strokeplay took place on Sunday the 22nd, won by Lorcan and Patrick Egan with a 59 nett, beating the 65.5 of Michael Simon and Gerry O’Dowd in to second place. This competition was sponsored by Boyle based business, East Brothers Machinery. UPCOMING COMPETITIONS – Next Sunday the 29th sees the first big competition of the year, the “Voucher”, which will be played as an 18 hole strokeplay competition. First prize for both Ladies and Gents is a free single membership for the year. Only fully paid up members are eligible to win, so if you haven’t done so already , pay your membership this week to give yourself an opportunity of winning it back next Sunday. The club is very grateful to our member Tom Kearney whose business “Quality Meats”, based in the Wine Street car park in Sligo, is sponsoring this competition. The annual fundraiser for Our Ladys Childrens Hospital, the “Crumlin Classic” will take place over the May Bank Holiday weekend. The mens’ mid week competition takes place again this Thursday, increasing this week from 9 holes to 12. RESULTS – The mens’ 9 hole competition played on Thursday 12/4/2018 was won by Brendan Gaffney, with Patrick Egan and Michael Rush taking 2nd and 3rd respectively. The competition was sponsored by Patrick Egan. The annual outing took place on Saturday 14/4/2018 to St Margarets’ Golf and Country Club in Dublin. Thanks are due to Gary Carty and Michael Rush who organised this trip. The overall winner on the day was President of the mens’ club, Michael Simon. In second and third places were Charlie O’Donnell and Ross Andrew, with the ladies prize going to Joey Mullaney. Mary O’Hara had a notable double, winning both the “longest drive” and “nearest the pin” prizes. An 18 hole Stableford was played on Sunday 15/04/2018, very kindly sponsored by Keating Amenity Solutions. David Purser had the winning score of 41 points, just edging out Frank Casserly on countback. The gross prize was taken by David Wynne and Tom Kearney was 3rd with 40 points. UPCOMING COMPETITIONS – On this coming Saturday, the 21st, the Boyle men take on Ballinamore in the second of their inter-club fixtures, the All-Ireland Four Ball competition. This tournament replaced the well known Cecil Ewing Shield competition 2 years ago. Next Sunday, the 22nd of April, sees a Scotch Foursomes competition for the men and the PGA Tankard competition for the ladies. We are very grateful to local Boyle business, East Brothers Machinery, for sponsoring the mens’ Foursomes competition. The following Sunday, the 29th, sees the most notable competition of the year to date, the “Voucher”. The first prize for this competition is a free single membership for the year, but only paid up members are eligible to win, so if you haven’t paid up by that date you may be doing yourself out of a chance to win one of the best prizes of the golfing year. COURSE WORKS – The golf course will be closed from Monday to Thursday this week to enable the postponed verti-draining to take place. The mens’ competition on Sunday the 8th of April was an 18 hole Strokeplay kindly sponsored by Ireland’s leading golf shop, Golfstyle, which is located in the Liosban Business Park, Tuam Road, Galway. Gerry O’Hara was the runaway winner with a 62 nett, beating fellow Ballinafad man Peter Leydon into second place with a 68 nett. The picture above shows Gerry receiving his prize from captain, Terry Canning.Charlie O’Donnell took the prize for best gross score and Frank Casserly was third with 69 nett. The Easter weekend Shambles fundraiser was won by the team of Paul Connolly, Patrick Egan, Conor Hamill and Moira Egan with 117 points.Second place went to Ted Hester, Frank Casserley, Lewis Shaw and Jim Callery with 112 points, and the Ladies Prize went to the team of Mary O’Hara, Joey Mullaney, Carmel Mc Garry and Carmel Conlon with 96 points. The first of the mens’ weekly Thursday night competitions took place on the 5th of April. The winner’s bottle of brandy found a home in Deerpark with Charlie O’Donnell in what has been a productive week for him. Upcoming competitions – Sunday the 15th sees the second of the new initiative of sponsored Sunday competitions for the men, this one being kindly funded by Keating Amenity Solutions. A ladies’ 18 hole stableford competition takes place the same day.The PGA Tankard competitions take place the following Sunday, the 22nd of April. In the second of this years inter-club competitions, the mens’ club are hosting Ballinamore in the first round of the All-Ireland Fourball Competition on Saturday the 21st. The course will be closed for a few days from this Tuesday while verti-draining takes place on all the greens and on some areas of cattle damage. The club wishes our member Lewis Shaw all the best in his year as captain of the Shepherd’s Crook Golf Society Charlie O’Donnell took the prize for best gross score and Frank Casserly was third with 69 nett. The Easter weekend Shambles fundraiser was won by the team of Paul Connolly, Patrick Egan, Conor Hamill and Moira Egan with 117 points.Second place went to Ted Hester, Frank Casserley, Lewis Shaw and Jim Callery with 112 points, and the Ladies Prize went to the team of Mary O’Hara, Joey Mullaney, Carmel Mc Garry and Carmel Conlon with 96 points. The first of the mens’ weekly Thursday night competitions took place on the 5th of April. The winner’s bottle of brandy found a home in Deerpark with Charlie O’Donnell in what has been a productive week for him. Upcoming competitions – Sunday the 15th sees the second of the new initiative of sponsored Sunday competitions for the men, this one being kindly funded by Keating Amenity Solutions. A ladies’ 18 hole stableford competition takes place the same day.The PGA Tankard competitions take place the following Sunday, the 22nd of April. In the second of this years inter-club competitions, the mens’ club are hosting Ballinamore in the first round of the All-Ireland Fourball Competition on Saturday the 21st. The course will be closed for a few days from this Tuesday while verti-draining takes place on all the greens and on some areas of cattle damage. The club wishes our member Lewis Shaw all the best in his year as captain of the Shepherd’s Crook Golf Society. COMPETITIONS – The competition that took place over the Easter weekend was an 18 hole Shambles team event and was played as a fundraiser for the club. Results to follow next week. This Thursday, the 5th of April, is an important day in the golfing world with the US Masters teeing off in Augusta and the mens’ weekly Thursday competitions commencing in Knockadoobrusna. For any member that wishes to sponsor one, please put your name on the sponsors list in the clubhouse. The competition for next Sunday the 8th of April sees a change from the fixture card in that it will be an 18 hole Stroke instead of a Stableford. In a new departure for competitions in the club, it will the first of a new series of sponsored Sunday competitions. This one will be sponsored by the west of Ireland’s number one golf shop, GolfStyle, who are based in the Liosban Business Park just off the Tuam Road in Galway. We are very grateful to GolfStyle for sponsoring the first of these competitions. OUTING – The club outing to St Margaret’s on the 14th of April is attracting great interest with approximately 20 people signed up. There are still a few places left so please make contact in the next few days if you intend going. INTERCLUBS – Hard luck to the men’s team who lost out narrowly to Ballaghaderreen in the Connacht 9 hole clubs’ championship on Easter Saturday. WORKS – The verti-draining that was scheduled to take place on the greens this week has been postponed until weather conditions are more suitable. The Boyle round of the Holmpatrick Cup was played on Sunday the 25th of March. In first place were Shane Loftus and Paddy McLoughlin with 44 points, just pipping Michael Rush’s and Michael Gilmartin’s 43 points in to second place. Congratulations to Shane and Paddy who go forward to the county final. Third place went to Patrick Egan and Lorcan Egan, who also had 43 points. Next weekend’s competition is a Club Fundraiser Fourball Shambles open to all Ladies and Gents members of Boyle Golf Club. The competition can be played from Good Friday to Easter Monday inclusive. The club asks all members to support this endeavour to raise money to spend on course maintenance and improvements. The men’s weekly Thursday competitions resume on Thursday the 5th of April. In the same week the mens’ section take on our neighbours from Ballaghaderreen in the first inter-club match of the year. This will be a first round match of the Connacht 9 Hole Clubs Championship which was established by the Connacht branch of the GUI last year as a competition to be played for between exclusively between the 9 hole clubs of the region. A number of our neighbouring clubs fall into this category including Ballaghaderreen, Ballinamore, Ballymote, Castlerea, Strokestown and Tubbercurry. RESULTS – An 18 hole Gents Stableford was held on Sunday the 18th of March. In first place was Vincent Egan with 36 points, Michael Simon took second with 34 points. Charlie O’Donnell took the gross and Owen Garvin came in 3rd with 34 points. The birdie tree winners were Sean Heslin and Charlie O’Donnell. COMPETITIONS – Next Sunday, the 25th, sees the Boyle round of the Holmpatrick Cup for the Gents. This is played as a Fourball Betterball, with the winners proceeding to playing against all the other winners in Co Roscommon, and then to provincial level if successful. The winners in each of the 4 provinces get to play the final in St Andrews, Scotland. The Holmpatrick is a fundraiser for the National Council for the Blind, and marks its 85th year in 2018. We are hosting a club fundraiser over the Easter weekend which will be played as an 18 hole Fourball Shambles. Members are asked to support this competition to help raise money for the works we hope to carry out during the year. OUTING- If there are people interested in playing in the club outing on the 14th April to St Margaret’s, we would ask them to put their names down, the trip will be cancelled if there is insufficient interest. THURSDAY COMPETITIONS – The mens’ weekly Thursday competitions will be starting again in a few weeks. This has been a very popular competition over the years, usually taking the format of 9 hole competition for its first few weeks in April and early May, then lengthening to a 12 hole as the evenings get longer. It is a welcome sign of the approach of summer when we see a crowd waiting around the first tee-box at 6 o’clock on a Thursday evening. A list for sponsoring the men’s weekly Thursday night competitions is on the noticeboard in the clubhouse. The club asks all men who play in this on a regular basis to consider putting their name down to sponsor one. RESULTS – An 18 hole Gents’ Foursomes competition took place on Sunday the 10th of March. Results to follow. MEMBERSHIP – We would be grateful if any memberships due could be paid in the next few weeks. For any new members, membership rates are available on www.boylegolfclub.com, with particularly competitive rates for those who are taking up golf for the first time. We have been happy to see some new faces playing golf in Boyle in the past few weeks and the Mens’ Committee meeting this month approved applications for 5 new members. 25th of March by the Boyle heat of the Holmpatrick Cup for the men. There will also be an 18 hole Stableford for the Ladies that day. The Easter weekend will see a club fundraiser, playable from Saturday the 31st of March to Monday the 2nd of April inclusive. The format will an 18 hole Fourball Shambles (i.e on each hole all players on the team drive off, all then play their second shot from their teams’ best drive and complete the hole as per a scramble). All members are encouraged to enter and to recruit any of their friends in other clubs that may be interested in playing. The first of the Interclub matches for 2018 takes place in early April with the Boyle men hosting Ballaghaderreen in the Connaught 9 hole clubs competition. There is a sheet on the noticeboard for all members interested in going on the club outing to St Margaret’s on the 14th of April. WORKS ON THE COURSE – There will be a meeting held in the clubhouse in the coming weeks to organise volunteers for various duties during the year. Volunteers are absolutely essential for the running of the club and members are encouraged to consider contributing a few hours of their time during the year, whether it be behind the bar, on the course or maintaining the clubhouse and its immediate environs. Weather permitting, it is hoped to carry out some verti-draining in the first week in April to include both the greens and the areas damaged by cattle in December. This work requires sand to be brushed in to the holes created by the drainage machine, and the club requests that any members who may have some spare time that week to bring a brush and help out for a while. A new shed is currently under construction to the rear of the existing one and it is also hoped to commence the finishing touches to our new practice chipping green shortly. It is with great sadness that we learned this week of the sudden passing of Fred Perry. 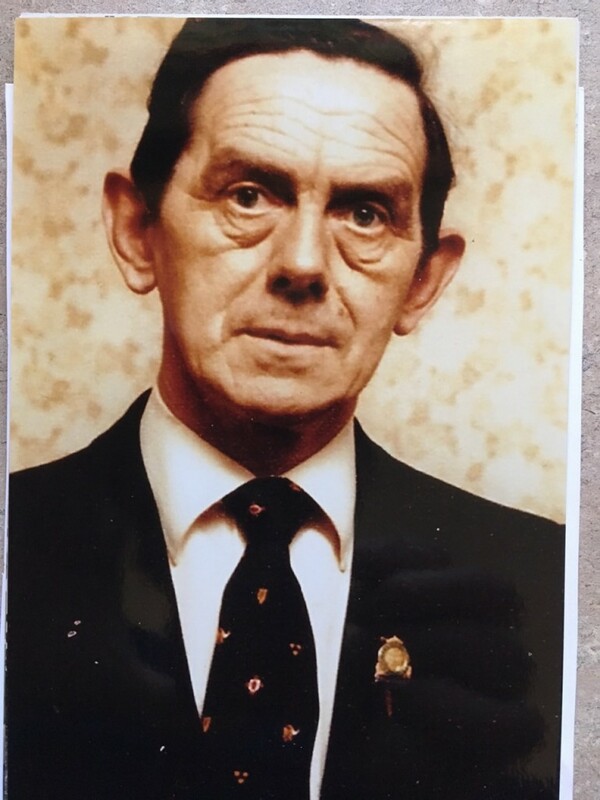 Fred was a former Captain and President of Boyle Golf Club, and at the time of his death had almost half a century of unbroken service with the Golfing Union of Ireland, including having served as President of the Union in 1982, a huge honour for both Fred and Boyle Golf Club. He remains the only member of the club to have served in this capacity. Fred served the GUI in several roles over the decades and was involved as referee when Rory McIlroy became the youngest ever winner of the Irish Close Championship in Westport in 2005. Fred was awarded lifetime honorary membership of Boyle Golf Club several years ago in recognition of his contribution to the game both here in Boyle and at national level. Fred’s work ethic and desire to promote the game remained as strong as ever and despite being in his 85th year he remained active in the GUI and was due to chair a meeting of their constitutional review committee this week. An obituary has been published on gui.ie describing Fred’s career in golf. Deepest sympathies are extended to Fred’s family and many friends. Funeral arrangements for Fred are as follows: reposing at his residence at Carrick Road Boyle Monday 4.00pm to 7pm. Removal from residence Tuesday 1.30pm for service at Church of Ireland, Boyle at 2pm. The Club will hold a guard of honour on Tuesday at 1.30pm at Green Street (Credit Union). Club Members are asked to wear club blazers or club/blue jumpers. The Golf Course remained closed this past weekend and the Spring League was reduced to just two rounds due to the poor weather conditions. Congratulations to Brendan Gaffney, Vincent Egan and Moira Egan who are this years winners. Next Sunday, the 11th of March will see the start of the 18 hole Competitions with an 18 Hole Mens’ Foursomes. The 2018 Captains Drive-In took place in perfect conditions on Sunday the 25th of February. Captains Terry and Marie hit 2 well-struck drives up the 1st fairway, thus launching the golfing season in the traditional manner. They would like to thank the members for the great turnout on the day. After the ceremonial start, a social 9 hole scramble was played. In first place was the team of Brendan Gaffney, Paul Connolly, Margaret Loftus and Owen Garvin. Second place went to Lorcan Egan, Willie Tiernan and Fiona Keenan, and in third was the team of Captain Terry Canning, Lady Captain Marie Hanmore-Cawley and Michael Rush. Thanks very much to Jim Mooney who took the photos of the Drive-In. Next weekend, the 3rd and 4th of March, sees the final round of the Spring League. Vincent Egan, Moira Egan and Brendan Gaffney are the in-form team at present, but they have a tight lead over the next 2 teams. A 9 hole stableford competition for the men will also be played on Sunday the 4th of March. On Sunday the 11th of March there will be an 18 hole Mens’ Foursomes competition. This weekend saw round 3 of the Spring League take place ( round 2 has been postponed til the weekend of March 3rd and 4th due to the inclement weather conditions of last week). The leaders after round 1, Moira Egan, Vincent Egan and Brendan Gaffney continue to be the pacesetters with an aggregate score of 119. Charlie O’Donnell, Ted Hester and Michael Rush are a close second on 122.5 , with the last podium place currently occupied by Willie Tiernan, Tommy King and Jim Callery. This week saw a meeting take place in the Clubhouse to discuss some proposed changes in the layout of the course. There were no objections and the club has already initiated some of the changes, starting with new out of bounds areas behind the 1st green and to the right of the 6th fairway, and the widening of the “spinney” water hazard to the right of the 2nd fairway. The other changes will be seen over the next few months and include open drains in front of the 5th and 9th greens, trees between the 2nd and 4th fairways and introducing areas of rough around some tee-boxes. Other work planned this year includes the finishing of the recently constructed chipping practice area by installing drains and preparing the surface of the green. A practice driving net will also be installed beside this green. The club has arranged a social golf outing to St Margaret’s Golf and Country Club in Co Dublin on Saturday the 14th of April. Boyle member Gary Carty works in St Margaret’s and has obtained a great deal for us for 18 holes of golf followed by a 2 course meal for 40 euro. All members are invited. Next weekend sees the official launch of the golfing year with the Captains’ Drive-In. The draw takes place at 12.45 pm with tee-off at 1. The bar will be open and food will be available. Weather conditions akin to a succession of biblical plagues resulted in many of the 2nd round matches from the Spring League not taking place this week. All members are invited to attend a meeting in the clubhouse this coming Wednesday the 14th of February at 7.30 pm to discuss a number of proposed changes to the layout of the course. A full account of the proposals is available on the club website under the “Course” section. Many of the proposals are acknowledging the reality that some areas of the course never dry out fully in the course of a year and that cutting and maintaining these areas has become disproportionately labour intensive. It is proposed that several such areas be left uncut throughout the year. In the same vein, it is proposed that 2 open drains be created on both the 5th and 9th holes to protect the 5th green from flooding and to improve drainage on the 8th and 9th holes in the area near the 9th teebox. There are a few other proposals including some tree-planting, re-aligning semi-rough areas and widening of hazards. The Captains Drive In takes place on Sunday the 25th of February. Round 1 of the clubs Spring League competition has concluded with the two leading teams separated by the tightest possible margin. Currently in first place are Brendan Gaffney, Vincent Egan and Moira Egan on 60.5, just ahead of Charlie O’Donnell, Ted Hester and Michael Rush on 60.6. In third place this week are Jim Mooney, Pat Conroy and Fiona Keenan on 62.7. The full leaderboard is available on the club’s website. The Spring League continues over the next 2 weekends and is followed by the “Drive In” on Sunday the 25th of February. Captains Terry Canning and Marie Hanmore-Cawley will get the 2018 golfing season off to its official start that day and welcome all members to join them. The winners of the Gents Fourball Betterball played on Sunday the 28th of January were Ross Andrew and Gerry Carty with 42 points, closely followed by Vincent and Lorcan Egan with 41 points. The club would like to thank all those involved in getting the course re-opened after recent damage incurred. The draw for the Spring League competition also took place on Sunday the 28th, with the competition to take place over the first 3 weekends in February. There are the usual “notable” draws in this….Conor Hamill has the added responsibility of ensuring Captain Terry and Lady Captain Marie are still on speaking terms by the time the drive in happens, and Brendan Gaffney will similarly have to tread carefully. Good luck to all in their various golfing and peacekeeping endeavours! The course remains closed for necessary renovations. The membership rates for 2018 are now available and include a competitive rate of 170 euro for first year beginner members, 60 euro for Juniors and 185 euro for “distance members” – i.e someone who resides over 50 km from Boyle. The distance memberships are especially popular among people from the area who no longer live here but who visit occasionally, and these members are considered an integral part of our club. Contact Terry on 086 8297496 or Paula on 086 6038638 or info@boylegolfclub.com. Our fixtures have been released for 2018, upcoming highlights include the Spring League taking place over 3 weekends in February and the Captains Drive In on the 25th of February. The Clubs Christmas Bonanza Competition was played on Sunday the 17th of December. Shane Loftus came 1st in the men’s competition with 32 points. The next 3 places in the men’s section went to David Purser, Terry Canning and Ross Andrew, who each had 31 points and were separated only on countback. Ruth Hogg won the ladies’ section with Carmel McGarry in 2nd place. 3rd and 4th went to Paula Cull and Moira Egan respectively. At the prize-giving Men’s Captain Terry Canning presented Patrick Egan with a trophy for topping the order of merit for Golfer of the Year 2017. Raffle prizes were won by Michael Simon, Michael Rush, Patrick Egan, Susan O’Mahoney, Michael Gilmartin, Jonathan Egan and Marie Gallagher. The golfing year in the club has not yet concluded with a Gents 9 hole Stableford planned for next Sunday, Christmas Eve and on the 27th of December we will hold our Christmas 9 hole Ladies and Gents Scramble. Names need to be in for the draw for teams at 12.45 with a shotgun start at 1pm. The Gents 18 hole stableford competition held on Sunday the 3rd of December was won by Sean Heslin with a score of 41 points, with second place going to Patrick Egan who had 38 points. Jim Mooney won the gross prize and Owen Garvin took 3rd place with 36 points. Next Sunday’s competition is the ever popular Christmas Bonanza Ladies and Gents 18 hole stableford competition with prizes for Ladies and Gents 1st, 2nd ,3rd and 4th. Everyone who plays in this competition gets to take home something, so if you haven’t featured in the winners enclosure in 2017 , this might be as good as it gets! The presentation of prizes will take place afterwards in the clubhouse at 6 pm. Online booking is available for tee-times. The clubs AGM was held in the clubhouse on Sunday 19th of November. The clubs Management Committee for 2018 comprises of the following members – Chairperson Terry Canning, Honorary Secretary Martin Wynne, Honorary Treasurer Paul Connolly, Greens Convenor Michael Rush, Clubhouse Convenor Vincent Egan, Junior Convenor Brendan Gaffney. They are joined on the committee by Jonathan Egan, Liam Whyte, Liam Mullaney, Patrick Egan, Liz Dwyer, Susan O’Mahoney, Marie Hanmore-Cawley, Michael Simon, Gerry O’Hara, Mary O’Hara and Willie Tiernan. In the men’s 18 hole stableford played on the same day, Sean Heslin kept it in the family by beating Shane Loftus on countback, both having 41 points. Patrick Egan came in third with 40 points. Upcoming dates include a men’s 18 hole Stableford next Sunday the 26th of November, and the ever popular men’s and ladies Christmas Bonanza competition on Sunday the 10th of December. The Men’s 18 Hole Stableford held on Sunday the 12th of November was won by our new Greens Convener, Michael Rush, with a score of 39 points. In second place was Gary Carty with 38 points, the best gross score went to Patrick Egan, and in third was Frank Flanagan with 37 points. Our nine hole stableford Winter Open can be played from Monday to Saturday every week throughout the Winter, and a men’s 18 hole stableford competition will be held next Sunday, the 19th of November. The Club AGM also takes place that Sunday at 5 pm in the clubhouse. This is the AGM of the “parent club”, i.e, the combined men’s and ladies sections and all members of the club are very much encouraged to attend. The men’s AGM was held on Sunday 5/11/17 in the clubhouse presided over by the outgoing captain Gerry O’Hara. Condolences were expressed to the family of our past Captain, Michael Archer, who passed away in 2017. Gerry in his report thanked those who had supported him during the year, and mentioned developments in the club during 2017 which included the display of photos of previous Captains and Lady Captains in the clubhouse, and most especially the successful completion of course development works, part funded by the National Lottery Sports Programme. This work included additional drainage on the course itself, the construction of a chipping practice area, the purchase of machinery and the erection of a new shed. Gerry thanked the members of the sub committee who oversaw this work. Gerry wished incoming Captain Terry Canning the best of luck in 2018. The honorary secretary, Martin Wynne, paid tribute to Gerry for his commitment to the club in his year as Captain and also to those who volunteered their services within the club during the year, in particular Michael Rush who stepped in at short notice as Competition Secretary during the year. The following officers were elected to the men’s committee for 2018 : Captain -Terry Canning, President – Michael Simon, Honorary Secretary – Martin Wynne, Treasurer – Liam Mullaney, Competition Secretary – Willie Tiernan, Handicap Secretary – Patrick Egan, Communications Officer – Jonathan Egan. They will be joined on the committee by Brendan Gaffney, Seamus Gallagher, Liam Whyte, Michael Rush, Paul Connolly, Vincent Egan and Gerry O’Hara. The overall club AGM will be held in the clubhouse on Sunday 19/11/2017 at 5 pm. Winter Open 9 Hole S/Ford Play any Day Monday – Friday. Winter Open 9 Hole S/Ford 1st Ross Andrew 20pts. 1st Nine Gerry Nerney, 2nd Nine Gerry O’Dowd, 3rd Nine Sean Heslin. The Ladies Winners were: 1st Liz Dwyer , 2nd Aisling Gaughran , Gross Tish Perry , 3rd Claire Cryan 12 Hole S/Ford Thursday 3rd August 1st John Mc Guinn 27pts, 2nd lorcan Egan 26pts, 3rd Jim Dwyer 26pts. Fixtures Men’s 12 Hole S/Ford Thursday 10th Re-Scheduled July Monthly Medal 18 Hole Stroke Sunday 13th Connacht Shield Inter Club against Co. Sligo Golf Club takes place on Monday 14th. Junior Lessons will take place as usual on Saturday Morning at 11.00am. The Club would like to take this opportunity to thank all our sponsors for their Kind & Continued Support of our Open Week. Thank You to the Members & Visitors who Played in the various Competitions during the Week. Thank You to the Open Week Committee for all their hard work in making the Week a great success. Gents 12 Hole S/ford takes place on Thursday 13th July , Jack O Sullivan Inter Club Competition takes place on Thursday 13th July , Social Evening Golf 3 ball Scramble on Friday 14th Draw at 6.30pm. James Shivnan Memorial Golf Challenge in Aid of Mayo/Roscommon Palliative Care will take place on Saturday 15th July. Your Support for this Competition would be greatly Appreciated. Fore Club Alliance 1st Michael Simon 39pts, 2nd Jim Dwyer 39pts, 3rd Owen Garvin 38pts. Ladies 1st Ann Neary (Strokestown), 2nd Peggy Feely, 3rd Ruth Hogg. Ladies Australian Spoons 1st Mary O Hara & Carmel McGarry, 2nd Liz Dwyer & Regina McLoughlin, 3rd Peggy Feely & Moira Egan. Friday Ladies & Gents 9 Hole S/Ford , Saturday 18 Hole Fourball Betterball – Juniors Skills Challenge , Sunday Ladies & Gent’s 18 Hole Stroke. The Club would like to Thank all our Sponsors for Open Week & Competitions throughout the Year. Thank You to Betterbuys/Surprises who Sponsored Sunday’s June Monthly Medal and the winners were 1st Eamon Perry 65 , 2nd Liam Whyte 66 , Gross Sean Heslin 78 , 3rd Jim Dwyer 67. In other Competition news Congratulations to Paul Connolly & Cian Smith who booked their place in the Final of the Club Foursomes Trophy and now await the Winners of the other Semi-Final between Sean Heslin & Michael Rush and Jim Dwyer & Liam Whyte. This Week will see the completion of the Drainage work on the Course and the New Practice Area. Thank You to Niall Foran and his Team for the very Professional way the in which the work was carried out Thank You to all who were involved on the Lottery Fund Committee & the Course Committee for all their hard work. In other Competition News Well Done to Michael Simon & Lewis Shaw who booked their place in the Semi-Final of the Foursomes Matchplay Trophy. The Presentation for Seamus Gallagher’s President’s Prize took place on Sunday Evening. Seamus thanked everybody for their support over the weekend and he also thanked all who work on the course and all who help out in the clubhouse. Congratulations to Vincent Egan on winning his 1st Major after 40 years. I am sure Vincent would say himself it was worth the wait. The full list or winners were 1st Vincent Egan , 2nd Paul Connolly , 27 Gross Patrick Egan , 3rd Pat Brogan , 18 Nett Gerry O Hara , Past Pres Brendan Gaffney , Senior Prize Paddy Nangle , Cat 1: Terry Canning , Cat 2: Ross Andrew , Cat 3: Paddy McLoughlin , 1st Nine David Wynne , 2nd Nine Kevin O Connor , 3rd Nine Charlie O Donnell , Student Prize Cillian Doyle. Next Sunday 18th June is the Lady Captain’s Prize 18 Hole Stroke and also the Lady Captain’s to Men 18 Hole S/Ford. Congratulations to our Lady Captain Mary O Hara who won the President’s prize to Ladies on Sunday with a score of 72, in Second place was Tish Perry with 72 and the Gross was won by Peggy Feely and Third Place went to Susan O Mahoney with 73. In the Men’s 18 Hole S/Ford Well Done to Sean Heslin who won with a score of 43pts, in Second place was Kevin O Connor with 42pts, the Gross went to Gary Carty with 74 and in Third place was Vincent Egan with 41pts. Next Sunday 11th June we have the 2nd Major of the Year the President’s Prize hosted by Seamus Gallagher. The Club would like to take this opportunity to wish Seamus the best of luck next Sunday. In the Club Foursomes Matchplay Sean Heslin & Michael Rush are the first pair to book their place in the Semi Final and all other matches are to be played must be completed by Sat 17th June. The May Monthly Medal 18 Hole Stroke Sponsored By The Mayfly Inn Ballinafad was won by Seamus Gallagher with a score of 63, in Second was Eamon Perry also with a score of 63, the Gross went to Patrick Egan with 72 and third was Frank Flanagan with 64. As today’s competition was also the Qualifier for the PGA Tankard Seamus will be joined by Susan O Mahoney who won the Ladies PGA Tankard with a score of 59, second place went to Joey Mullaney with 68 , the gross went to Tish Perry and third place was Mandy Toolan with a score of 69. Well done to Seamus & Susan and we wish them the best of luck when they go to Royal Tara Golf Club in August. Commiserations to the Pierce Purcell Team who were beaten by Strandhill 3 – 2 on Saturday afternoon. The President’s prize to the Ladies will take place on Sunday Next & there is an 18 Hole Stableford for the Men. There will be No Competition for the Ladies on Tuesday or Men’s Competition on Thursday Due to drainage work taking place on the course this week. The Third Round has been extended for one week. All Matches must now be played by Saturday 17th June. Junior Golf lessons will take place on Saturday morning at 11am as normal. We are delighted to announce that The Lottery Funded Drainage Work on the course will commence this Monday the 29th of May. Unfortunately, while this work is taking place, The Golf Course will remain closed from Monday-Friday and will Re-Open for the Weekend. We are sorry for any inconvenience this may cause. Last Sunday’s Bart Moran Trophy was won by Pat Conroy with a score of 64, in second was Jim Dwyer with 66, the gross prize was won by Gary Carty with 72, and in third was Pat Brogan with 67. The ladies Niamh Nangle Cup was won by Marie Hanmore Cawley, in second was Ruth Hogg while in third was Paula Cull. Well done to all prize winners. Last Thursday’s men’s competition was won by Sean Heslin with 24pts, in second was Michael Rush 23pts and third was Ted Hester also with 23pts. Next Sunday will see the first Monthly Medal 18 hole stroke which is the second competition in the Brogan’s totalhealth Pharmacy Golfer of the Year series. It is aptly and kindly sponsored by the Mayfly Inn, Ballinafad. Many thanks to them for their sponsorship. The men’s Thursday competition also continues this week. Entries are now being taken for the club’s singles matchplay competition, the King Harmon Cup. The sign up sheet is on the noticeboard. The foursomes matchplay competition has progressed to round three with these games to be played by 10th June. Commiserations to the Jimmy Bruen team who were beaten on scoreline of 3-2 with two of the away games losing in extra holes. It’s a busy period on the interclub golf calendar with the Mixed Foursomes team playing Castlerea on Wednesday and the Pierce Purcell team playing Strandhill on Saturday. Good luck to both teams. Junior Golf lessons for kids aged 8-16 began last Saturday at 11am and will continue every Saturday until the end of August. They are coordinated by Junior Convenor Brendan Gaffney along with Moira Egan & Paddy Nangle and are free of charge (excluding membership). Commencing with the most recent results, the Club Fundraiser held over the Bank holiday weekend was won by the trio of 1st Michael Simon, Michael Reid & Frank Flanagan with 93pts, in second was Pat Brogan, Paul Connolly & Seamus Gallagher with 87pts and in third was Terry Canning, Ross Andrew & Gerry O Hara 86pts. Thanks to all who played, some more than once – It is much appreciated by the club. The previous weekend the voucher competition for men and the ladies lucky strike took place. The two respective winners were Terry Canning & Moira Egan both of whom will get to enjoy complimentary golf in the year ahead. Second in the voucher went to Jim Dwyer, gross prize to Brendan Gaffney & third to David Wynne. The ladies runner up was Regina McLoughlin, the gross winner was Tish Perry & third was Liz Dwyer. The first men’s Thursday competition was held on Thursday 13th April. In first place was Pat Conroy with 21pts, Owen Garvin was second and Sean Heslin was third, both with 17pts. This Sunday there will be an 18 hole singles stableford competition for men. The men’s Thursday competition will also take place this week. Commiserations to the 9 hole club team who lost to Dunmore Demesne last Monday. This was our first interclub match of the season. Next men’s team up is the seniors who play Ballinamore on the 3rd May. In ladies interclub golf, good luck to the challenge cup team who play Roscommon on Saturday. The draw for this year’s edition of the competition has been made available to view on our website or club noticeboard. Jonathan Egan & Seamus Gallagher will be looking to make it a hat-trick of wins having captured the title in 2015 & ’16. The deadline for those involved in the preliminary round is Saturday 29th April to complete their match. Last Sunday’s singles stableford was won by Jim Mooney (10) with 38pts, in second was Padraig O’Connell (16) with 37pts, the gross prize went to Terry Canning, and in third was Pat Brogan (19) also with 37pts. The winter 9 hole competitions have came to a conclusion as of the last week of March. Thanks to all who supported these competitions. This weekend the rescheduled gent’s voucher and ladies’ lucky strike competition will take place. They will be playable either Saturday or Sunday. Unlike the traditional one day event it has been in the past, the decision was made to play it over two days to facilitate those members who wish to support Boyle Celtic FC in the Showgrounds on Sunday afternoon in their FAI Junior Cup semi final. In related news, congrats to members Brendan Gaffney & Mandy Toolan in their involvement of the production of The Boyle Celtic Song which reached number one in the Irish iTunes download charts! The club would like to send their best wishes to the team ahead of this weekend’s historic game. Sponsors are currently sought for the men’s Thursday competition which runs each week beginning Thursday 13th April. If you wish to sponsor one of these, please write your name on the sheet provided on the noticeboard. Also, there is an opening for businesses or individuals to sponsor our new monthly medal competitions which will be held on the last Sunday of every month. These competitions will form the core of the Golfer of the Year series and will be the gents flagship events outside of the clubs majors. A presentation of prizes will be held on Sunday evening next after the voucher competition. Other prizes to be presented include those for the Boyle Courthouse Classic. The attendance of prize winners is requested. This upcoming Sunday 2nd April, the gents voucher and the ladies lucky strike competitions will be held. Members are reminded that membership payments are now due. Our membership Secretary is Paula Cull, Drumderrig House, Abbeytown, Boyle. The scarifying of greens is being carried out on Monday this week so the course will remain closed while this work is in progress. A list of volunteer tasks are available to view on the noticeboard. Members are encouraged to make themselves available and lend a hand if they have some free time. The volunteers coordinator is Michael Rush. The Spring League Final is scheduled for this Sunday 5th March. A fourball betterball competition will also take place for gents on Sunday. The Spring League sponsored by PD Golf has entered the business end of proceedings with two of the four groups having completed all of their group matches. Only a few games remain outstanding in groups 2 and 4 and may be played any day up until this Sunday. In group 1, Peggy Feely & Kevin O’Connor have secured their place in the final by winning their final match 2 up to leave them on a five match aggregate of +12, a score sufficient to top the group. Shane Loftus & Regina McLoughlin finished one behind and will possibly take one of the two best runners up spots. In the second group, Paul Connolly & Seth Meredith lead and are in a strong position to top the group. Their total score of 9 up leaves them 6 clear of 3 other pairs, one of them being Dave Purser & Claire Cryan who have a game outstanding. Moving to group 3, Vincent Egan & Lewis Shaw have completed a clean sweep in their group finishing with a total aggregate of +18, the highest score recorded in the competition. They are followed by Pat Conroy & Susan O’Mahoney who won 4 of their 5 games, finishing with a total score of +13. In the final group, Michael Rush & Gerry O’Hara continue to lead on +8, followed by Paddy McLoughlin & Mandy Toolan on +5. Also, don’t rule out Willie Tiernan & Sandra McCrann who are only 3 holes further back with one game yet to be played. Last week’s 9 hole stableford was won by David Wynne with 19 points. This week the weekly 9 hole re-entry competition continues and may be played any day Monday to Saturday inclusive. Next Sunday there will be an 18 hole stableford for gents. Entry fee will be €7. This week is also the final chance to get unplayed Spring League matches completed otherwise the non played scores will be applied. The Spring League group stage has entered the final two weeks with each pair having played at least three of their five matches. Group 1 sees Peggy Feely & Kevin O’Connor take up a strong position to progress after a 7 hole win over their opponents at the weekend. Shane Loftus & Regina McLoughlin are now in second. In group 2, Paul Connolly & Seth Meredith continue to lead and hold a 5 hole lead over Jim Dwyer & Tommy King. The third group has co leaders with the pairs of Pat Conroy/ Susan O’Mahoney and Vincent Egan/ Lewis Shaw neck and neck on +12. Group 4 is a tight affair with most pairs still having a genuine chance of qualifying for the final. Michael Rush & Gerry O’Hara sit on top of the group with an aggregate of +8, three ahead of Paddy McLoughlin & Mandy Toolan. Last week’s weekly 9 hole stableford was won by Michael Reid with 20 points. This week is week 5 in the PD Golf Spring League. Many pairs will be looking to wrap up their group matches by the end of this week. However there is an extra week to facilitate those who still have two games to play. The deadline is Sunday 26th February. The weekly 9 hole stableford is playable this week until Sunday inclusive. The PD Golf sponsored Spring League continued this week with overnight frost delaying action on Sunday for the second week running. Beginning with the first group the biggest movers were Peggy Feely and Kevin O’Connor who had a 5 hole win over their opponents which leaves them in second place behind Shane Loftus & Regina McLoughlin. In group two, Paul Connolly & Seth Meredith now lead the way after having overtaken Jim Dwyer & Tommy King who now lie in second position. Moving to group three, Vincent Egan and Lewis Shaw remain in poll position despite taking a break this week! Pat Conroy & Susan O’Mahoney stay in second place but have closed the gap to two holes. In the fourth group, pairs five and six, namely Michael Rush/Gerry O’Hara and Paddy McLoughlin/Mandy Toolan are currently jostling for the top spot with the former holding the upper hand by one hole. The weekly 9 hole stableford competition was won by Michael Rush with 20 points. The Spring League enters week number four this week with the schedule of matches for the fourth round as follows: Pairs 1 vs 4, 3 vs 5 and 2 vs 6. The weekly 9 hole stableford is playable Monday-Sunday inclusive. The club extends its sympathies to the McLoughlin family on the recent passing of Margaret. Ar dheis dé go raibh a hanam. The Spring League continued this week with frost delaying play on Sunday morning till approx 11am. In group 1, the pairing of Shane Loftus and Regina McLoughlin have taken the lead after a 6 up win over their opponents at the weekend. Gary Carty & Carmel Keenan remain in second position despite a narrow loss in their game. In group 2, Jim Dwyer and Tommy King have taken a commanding lead with back to back wins, most recently a 6 up win to bring their total to +8. Currently, the second best score in the group is held by Paul Connolly & Seth Meredith who won their first game 5 up. Group 3 sees Vincent Egan & Lewis Shaw come through to take up first place on +7 who are 4 holes clear of two pairs, Charlie O’Donnell & Fiona Keenan and Pat Conroy & Susan O’Mahoney. In group 4, Paddy McLoughlin and Mandy Toolan still hold the lead on +6 who are two holes in front of Michael Rush and Gerry O’Hara. Last week’s weekly 9 hole competition was won on a countback by Sean Heslin with 20 points. Spring League matches are playable this week with the round 3 schedule being pairs 6 vs 4, 2 vs 3 and 1 vs 5. An extra day, Sunday 26th February has been added to facilitate players struggling to get all matches played. The drive in will now take place on the second Sunday of March. The weekly 9 hole competition for men continues this week til Sunday inclusive. The monthly meetings of the ladies, gents and management clubs will be held this Wednesday evening February 1st in the clubhouse. The ladies and gents meeting will take place at 7.30pm and will be followed at 8.30pm approximately by the management meeting. Belated birthday wishes to greens convener Willie Tiernan and his partner Linda who held their joint birthday celebrations in the clubhouse recently. The PD Golf sponsored Spring League has gotten underway with most pairs having completed their first match by Sunday last. In group one Michael Simon and Tom Lavin are best placed with a four hole win over their opponents. Wins were also recorded by Gary Carty and Carmel Keenan and by Shane Loftus and Regina McLoughlin who finished 2 up and 1 up respectively. In group 2 Brendan Gaffney and Margaret Loftus lead the way with a three hole win. They are followed by Jim Dwyer and Tommy King who recorded a score of 2 up. In group 3 the pairing of Charlie O’Donnell and Fiona Keenan finished 3 up after 12 holes, a score which currently tops that group. Vincent Egan and Lewis Shaw occupy second place after a one hole win. Finally in the fourth group, Paddy McLoughlin and Mandy Toolan registered the greatest margin of victory to date with a 6 up win while in second is Michael Rush and Club Captain Gerry O’Hara who won their first match 4 up. The format of the competition is such that it is likely that all teams will have a chance of qualifying for the final right up until the last couple of rounds as standings can change quickly so all is not lost for those who did not win their first game! All five group matches are to be played by Saturday 25th February. Last week’s weekly 9 hole competition was won by Jim Mooney with 18 points. Spring League matches are up for decision again this week with the suggested order for round 2 are pairs 3 vs 4, 6 vs 1 and 2 vs 5 in each group. The weekly 9 hole stableford re-entry will also continue this week and can be played any day Monday through to Sunday inclusive. Sunday’s 18 hole stableford for gents was won by Terry Canning (12) 39pts, in second was Vincent Egan (18) 38pts, the gross was won by Charlie O’Donnell and in third was Seamus Gallagher (18) 36pts. The draw for the PD Golf sponsored Spring League has been made is available by clicking here. Round 1 matches are to be played by this Sunday 22nd January if possible. All 5 group matches are to be completed by Saturday 25th February. The final for the four group winners along with the two best runners up is set for Sunday 5th March. Entry fee is €5 per person per match excluding the final. A full list of rules is available on the club noticeboard. Also, this week there will be a 9 hole stableford (re-entry). It can be played any day Mon-Sun inclusive. Sunday’s 18 hole stableford for gents was won by Paul Connolly (18) 40pts. In second was Jim Mooney (10) 39pts and in third was Club Captain Gerry O’Hara (20) also with 39pts. The gross prize was won by David Wynne. The 9 hole re-entry competition held on New Years Day was won by Seamus Gallagher. On Sunday January 15th there will be an 18 hole stableford for gents. The entry fee is €7. The Spring League will commence on the week starting January 16th and can be played any day of the week. The format is fourball matchplay played over 12 holes for ladies and gents. The entry fee is €5 per person per match. The final is scheduled to be played on March 5th between the winners of each group along with the two best runners up. Update: 12.01 – We are delighted to announce that the Spring League will be sponsored by PD Golf located at Co Longford Golf Club. Many thanks to Pete for coming on board, and we look forward to forming a mutually beneficial relationship over the coming year.